Within the transition process, one of the key issues PACT is looking into is food sourcing. This will include where our food comes from, food miles, packaging, and how we can make the best use of the often abundant resources here in Cumbria! The Food Group is also looking to map other local groups and food producers in the Eden area. Please get in touch using our contact form or take part in the discussion forum. Click on the Education tag on the left to see what else is online here. If you have any suggestions for good local recipes using food produced in and around the Eden Valley, we'd love to hear from you - please tell us on the forum. 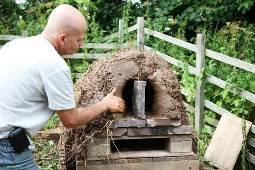 This year a Community Ovens project has taken shape, kick-started by building an outdoor wood-fired bread oven or 'cob' at The Watermill, Little Salkeld. We intend to build more wood-fired cob ovens in villages in Eden. Again anyone interested in this project can contact Peter or any member of the PACT Food Group. Our idea is to provide a community resource and education facility, preparing for a future when grid fuel supplies might not be as secure as they currently are. In the meantime the ovens provide a focal point for pizza parties and fund-raising events. Other on-going projects include further investigation into local food producers, especially organic suppliers, and from where food might be obtained – e.g. farm shops, Vista Veg, Farmers’ Markets etc. We are also looking at orchard mapping, advice swapping for vegetable growing, and ‘greening Penrith’ by offering our services to help plant useful (fruit bearing) trees in odd patches of public land around the town.